But that’s not all… the K10000 Max is even ruggerdised! In this article, we will share with you the key features, specifications and our hands-on previews of the Oukitel K10000 Max and K10000 Pro smartphones! Updated @ 2017-08-20 : Added new specifications and purchase links for the Oukitel K10000 Max and K10000 Pro smartphones. Despite what some websites are claiming, the K10000 Pro is not the first smartphone to feature the massive 10,000 mAh battery. That honour goes to its predecessor, the original K10000 that was released in December 2015. The K10000 Pro not only boasts updated specifications, and runs on the latest Android 7.0 operating system, it has a slightly bigger battery capacity of 10,100 mAh with fast charging capability. It maintains the original Oukitel K10000’s industrial stainless steel design. 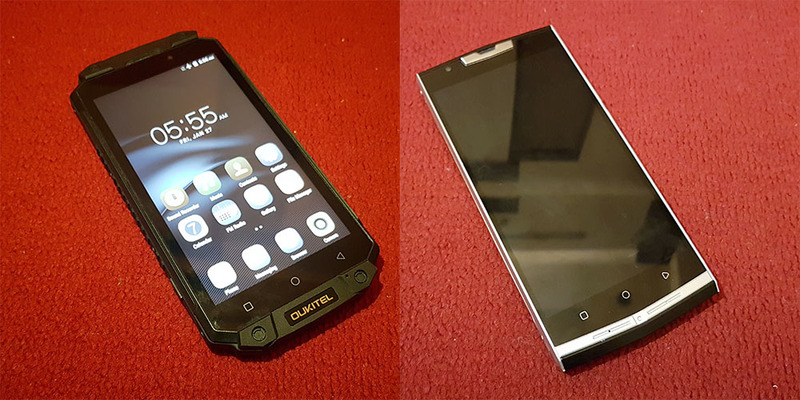 The Oukitel K10000 Max appears to be a ruggerdised version of the K10000 Pro. Thanks to its thick polycarbonate and rubber shell, it is waterproof and shockproof. It has slightly inferior specifications to the K10000 Pro – 3 GB of RAM, with a 13 MP main camera and a 5 MP front camera. It also uses the slightly smaller 10,000 mAh battery (with the same fast charging capability). On the other hand, it supports the new bidirectional USB 2.0 Type C connector, while the K10000 Pro still uses the old micro USB 2.0 port. This table compares the specifications of the K10000 Max and K10000 Pro smartphones. Here are some places where you can buy the K10000 Pro smartphones. The K10000 Max does not appear to have been released. We will update the article with purchase links when they do. Next : The ASUS ZenFone 4 Price List & Pre-Order Offers Revealed! pro’s memory is truly 3GB? I hope it’s a typo. You made a mistake on your chart. You swapped the 3GB and 4GB memory size between the two models. No, it is correct. The Oukitel K10000 Max has LESS memory (3 GB) than the K10000 Pro (4 GB). It was also mentioned in the article. We just added some purchase links for you.